The Book we read is literally swimming in it. out of which the Lord God creates. to wash it clean from the evil wrought by humankind. leading to the foundation of the people of Israel. for a thirsty, complaining people. and stack the stones of remembrance. and shouts out the promise of One Who Is to Come. as every other respondent to John’s call. God comes to the help of God’s people. No trumpets, no angels, no drum roll. A simple walk from the shore to the river. And the mission is launched. into the arena, ready for the main event? And what do we need to hear as well? He hears who he is. He hears he is loved. He hears he is pleasing. before we do one single thing. God is pleased with us. that we know these things to be true. as if Jesus himself is the well. Oh, how deeply can I draw from this Well as 2012 unfolds? How widely can I spray this essence of life around me? I am indebted to Pastor Don Johnson and the worship team at Montecito Covenant Church for most of the ideas contained in this reflection and most particularly for the beauty of a worship service in which we are given the precious opportunity to renew our baptismal vows. Swishing our hands in the waters of the font, singing, “All Who Are Thirsty,” every New Year, we remember again WHO WE ARE. Thanks be to God. Joining with lots of friends today as I’ve been away from this blog for over a week, traveling to get my mom moved and then re-settling at home with a too-full calendar. So tonight, I’m fixin’ to join with Michelle, Jen, Emily (if she’s open for business again), Ann, Jennifer & Bonnie. Each of these lovely sites has great writing going on – check them out. 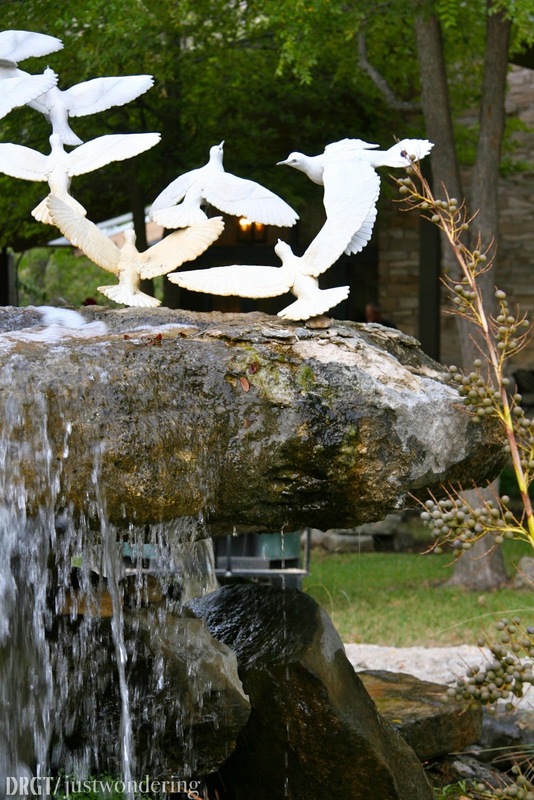 Ah…the fountain from Laity Lodge! I’m thinking,too, this year about all the water that flows through Scripture. I want to focus this year on its abundance. What a beautiful tradition your church celebrates each new year. Thinking of it undoes me. Your explanation of the significance for us, today, of God’s words at Christ’s baptism is beautiful. I needed it. That second photo–is that the Frio? And there’s that business about Moses striking the rock. You always give so much to think about, Diana. Going swimming with you this year. Never have I thought about water more than when we were in our drought. I love your reflections. thanks for stopping by with such kind words of encouragement, everyone. And yes, Sandy, the bottom 3 photos are from LL, 2 and 4 of the Frio. when I did a Bible Gateway search, I got 617 references to ‘water.’ Many of them refer to the same incident(s), so it probably drops down closer to 450-500, but still…that’s a lot of wet, right? Oh my word this is gorgeous and peaceful and rejuvinating, all wrapped into a beautiful post. And those photos, oh my! Thank you for this, Diana – so much peace breathed into my soul here today. Such beautiful thoughts on water. And I recognized your Laity pics. It reminds me that once I saw a baptism there, below the dam, where you walk from the Lodge over to the road to Blue Hole. It was a holy moment. I love the theme of your post – and the photos! I love those three things … lessons we all need to remember. i feel refreshed having come here, and being reminded of who i am in him. thank you friend. Ah … those photos! They make me homesick for Laity. Loved this whoe thing — how it flowed across the Old and New Testament to encompass the fullness of God’s story (our story!) in the Scriptures.